"We're still piecing together details, but it looks as though the incident began as an act of retaliation against Sinaloa by two foot soldiers from the Los Zetas cartel," DEA administrator Michele Leonhart said. "The Gulf and Tijuana cartels then responded before being ambushed by La Familia Michoacána and Los Negros. At that point, witnesses reported hearing roughly 357 million gunshots, during which time the Mexican populace was caught in the crossfire and killed." "A four-gram bag of cocaine was also recovered by agents," Leonhart added. Leonhart said the DEA has sealed off the 761,606-square-mile crime scene, which is littered with bullet-riddled bodies and assault rifles, and splattered with blood. The DEA investigation has so far determined that 20 million of the victims were murdered in the shoot-out while driving, biking, or walking to their homes, and that stray bullets killed another 8 million people watching the violence from their windows or balconies. An additional 1 million sons who set out to avenge the deaths of their fathers were annihilated in the final minutes while attempting to settle the score. Authorities also confirmed that a number of Mexican residents were immediately taken hostage by gangs, but all 20 million were murdered execution style when relatives failed to pay their ransom to local drug lords. Several tourists who managed to escape the violence by hiding in the ruins of Templo Mayor in Mexico City were stunned by the gruesome aftermath. "We just heard some shouting at first and then a bunch of gunshots," said Allan Curtis, who was on vacation with four friends. "It probably only lasted for a few minutes, but when we came out there were like 8 million bodies in the streets." In response to the violence, Mexican president Felipe Calderón declared a state of emergency before being gunned down at the podium by passing drug dealers. 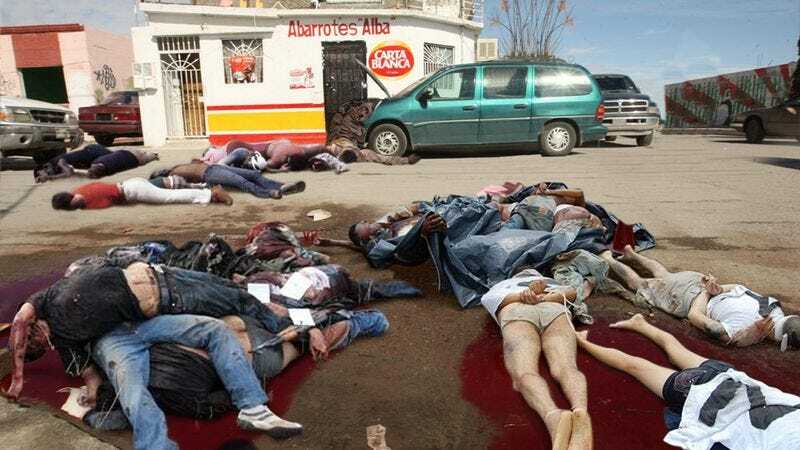 Mexican law enforcement struggled to maintain order during the massacre, with 4 million police officers taking point-bank shots to the face while attempting to collect bribes; others were reportedly driven out to the desert where corrupt partners slit their throats. "We are doing our best at the moment to locate any Mexican police or military officials who are still alive so that we may work hand-in-hand with them to combat the growing problem of drug violence in Mexico," Leonhart told reporters. "Episodes like this are simply unacceptable and will not be tolerated by the United States government." At press time, U.S. drug dealers said they were not sure how or when the vast supplies of marijuana left behind by the Mexican cartels would reach their intended consumers, but they wished to assure the American public that they are doing all they can.